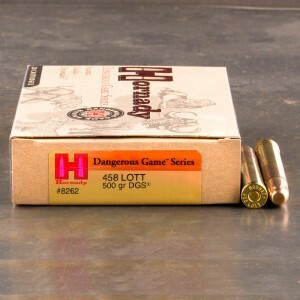 458 Lott ammunition is a big bore hunting round designed by John Lott in 1971. The round was designed to be a direct competitor to the famed and successful 458 Winchester Magnum. Lott designed the 458 Lott to be a more powerful contender, better suited for large and dangerous game. The round offers numerous improvements over the 458 Winchester Magnum, and is considered a premier cartridge for large game hunting. The round has more case capacity, and therefore allows a higher level of performance at the cost of increased recoil.